Put your ideas at high speed with more people, more places and in less time with the cheap Ricoh MP 6054 Black and white Laser Multifunction (MFP). Use high speeds to effortlessly produce up to 60 black-and-white copies or pages per minute (ppm). Use 2GB of RAM to handle large files and store frequently used documents on the 320 GB hard drive. In addition, you can share more with standard remote Internet fax, LAN fax, or IP fax functions. Convert your important printouts into digital files quickly and easily. Handle one-and two-sided originals for copying and faxing from the standard single-sheet feeder (SPDF) with 220 sheets and scan up to 180 images per minute (IPM) in color or black and white with up to 1200 dpi. Do you have a special project? Use thicker paper materials and larger paper sizes up to 11 "x 17"-including envelopes. Easily share information wherever you are. Print and scan directly from your smartphone with our SmartDevice Print & Scan app. Access your local network and cloud-based documents with our integrated cloud environment option. Or use the Near field Communication (NFC) technology to easily copy, print and Scan-just touch your smartphone with the 10.1 "Smart operation panel. Choose your finishing features for high-quality end-to-end document production. The MP 6054 offers a wide range of finishing options to suit your work volume and your budget. Choose from a variety of internal and external finishers and add options such as punching, shift sorting and much more. Extend your paper capacity to up to 4,700 pages to handle longer production runs in less time. They do not have to sacrifice productivity for sustainability. The MP 6054 is awarded a EPEAT ® Gold rating and is Energy STAR ® Certified. 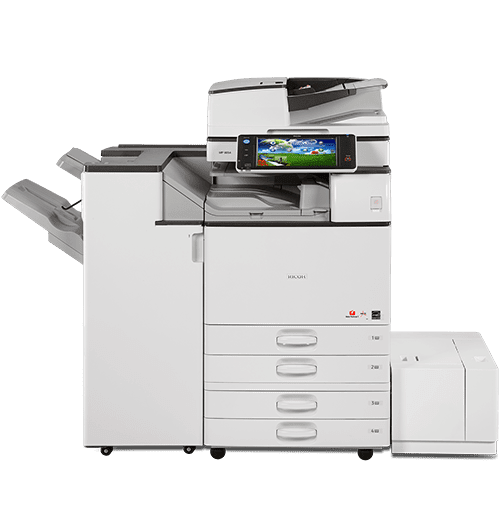 It has an extremely low value for typical power consumption (as determined by the Energy Star program's test requirements) and helps reduce paper consumption through features such as automatic duplex printing. In addition, Ricoh's recycling and recycling programs can be easily recycled. Discover a more intuitive, easy-to-use interface. With the optional Smart operation panel, you can speed up frequently executed jobs with the customizable home screen that you can readjust when your workflows change. Simplify routine tasks such as printing, copying, scanning, and faxing with familiar touchscreen controls, and use a centralized address book for faster communication. Your documents are valuable-your protection is immense. The DataOverwriteSecurity system automatically deletes latent data from previous jobs. The optional hard disk drive provides encryption protocols for securely storing and protecting documents. In addition, you can create custom PIN codes for user authentication and automatically embedded watermarks to prevent unauthorized duplication. Keep your workflow moving and manage it with confidence. Use Web image Monitor features to configure, organize, diagnose, and update your network MFPs-all through a standard Web browser. Save time with the Internet-based tool @Remote, automate counter levels, deliver alerts, and schedule service calls. Or use our App Device Manager NX Lite to configure and manage a fleet of networked print devices in real time. Save smartly, control costs, and see user activity at a glance. Add the optional Smart card reader to the MP 6054 to set quotas, monitor usage, and limit output for specific users or workgroups. It is also easy to customize remote permissions and easily calculate and separate costs by individual or workgroups. In addition, you save time and money by applying the settings uniformly to the network device fleets.